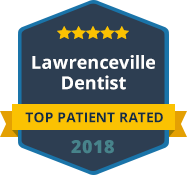 If you live in or near Lawrenceville and experience a dental emergency, you can count on the experienced professionals at Lawrenceville Family Dental Care to provide high-quality emergency dental care. We are a family dental practice serving children and adults of all ages. Our practice provides comprehensive dental care to the residents of Lawrenceville and Gwinnett County. If you have an emergency dental situation such as a severe toothache or a cracked or broken tooth, our dentist and staff will make every effort to get you into our office for treatment as soon as possible. Our dental team is equipped to handle urgent dental care and emergency dentistry situations during normal business hours. Dental emergencies can be extremely disruptive to your work and home life, and they tend to occur at the most inopportune times. If you have suffered a trauma to your mouth or if you have chipped a tooth, lost a crown, or you have a severe toothache, our dentists are available to handle your emergency so you can get back to normal as soon as possible. In addition to emergency dental care, our practice also offers a full range of general, preventative, restorative and cosmetic dental service as well as sedation dentistry. The dentist and staff at our family dental practice work hard to make your visits to our dental office as pleasant and as enjoyable as possible and to keep our patients relaxed and free of pain while receiving dental treatment. For top quality emergency dental care in Lawrenceville, call Lawrenceville Family Dental Care. Our family dental practice is currently accepting new patients and we would welcome the opportunity to care for you and your family. Whether you have a dental emergency or are in need of routine dental care, we are here to serve your needs. Contact Lawrenceville Family Dental Care today. Our practice welcomes patients with and without dental insurance coverage. We thank you for allowing us to take care of your dental needs and we look forward to exceeding your expectations.